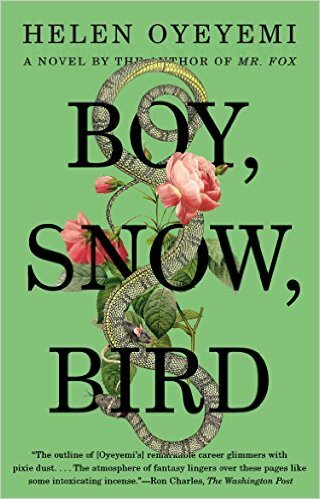 The most recent book I finished from this list published by the Huffington Post is Boy, Snow, Bird by Helen Oyeyemi. The story begins in the 1950s with the story of Boy Novak, a young woman brutally abused by her father. She leaves home and gets married to a man who has a beautiful daughter. When her own daughter with her new husband is born, Boy sends the beautiful daughter away. Here we delve into the race relations of the 1960s and the relationship (through letters) between two half-sisters: Boy’s stepdaughter and her biological daughter. The book is split into three sections: Boy’s story, her biological daughter’s story, and a final section that returns to Boy’s point-of-view and wraps up the story. Without giving too much away, I will say, I was completely shocked by the ending, when Boy discovers the truth about her father. My jaw is still hanging open as I write this, and I wish the author would have elaborated more on the shocking twist. This was an engaging read. Oyeyemi’s style offers a look inside the mind of her interesting characters. She knows how to surprise a reader, too, and I like that. Next postBrackets? The Big Dance? When Do We Eat?